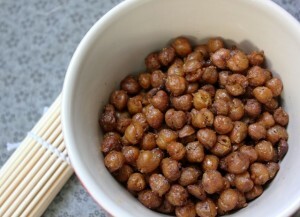 I happened to stumble upon Martha Stewart’s Spicy Roasted Chickpeas a while back and just haven’t been able to get them out of my mind! I recently mentioned that I’m a snack person. I love snacks…salty, sweet, spicy, sour. You name it, if it’s a snack, I want it! And most of you replied that you love snacks too so I didn’t think that you would mind these. And it doesn’t help at all that chickpeas actually have some nutrition packed in. They are low fat, and high in fiber and protein which makes them a (mostly) guilt-free snack. When roasted, they become crispy and crunchy and they make a perfect party snack. I chose to do a honey-cinnamon version for the sweet and a Greek-cayenne version for the spicy. Both were good but the spicy ones were definitely my favorite. I used Cavender’s Greek seasoning. If you don’t use this stuff, I’m suggesting you go and get some, and do it fast. This stuff is great for seasoning veggies, chicken, even popcorn. Especially when you just need some quick, simple flavor. I really loved it on the chickpeas, it added a salty flavor next to the spicy of the cayenne. Snack perfection! Drain chickpeas and rinse under cold water until the water runs clear. Spread out on a layer of paper towels and dry thoroughly. Remove skins if you wish; I didn't remove them all, just any loose ones. Line two rimmed baking sheet with parchment paper and spray liberally with non-stick cooking spray. In a medium bowl, combine oil, chickpeas, Greek seasoning, cayenne pepper, paprika, and salt. Toss until chickpeas are fully coated. In a medium bowl, combine oil, chickpeas, cinnamon, sugar, honey and vanilla. Toss until chickpeas are fully coated. Place chickpea mixtures on separate baking sheet and spread in a single layer. Bake for 45 – 55 minutes. Toss every 15 minutes to ensure even cooking. 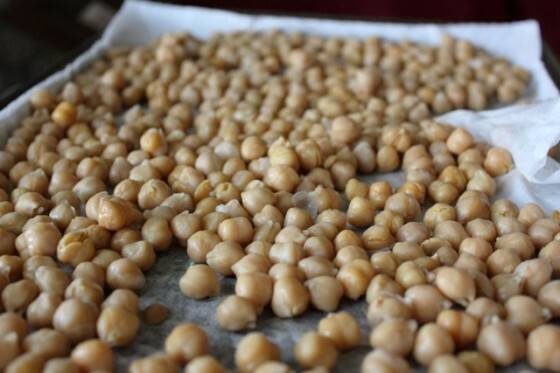 Chickpeas are ready when they are golden brown and crispy. Transfer to paper towels and let cool slightly. Store chickpeas in an airtight container. This snack would be wonderful with any spices or herbs that you like. Feel free to try what fits your tastebuds! ooo I love chickpeas! What great ideas you have on roasting them sweet & spicy. Great flavors 🙂 Happy holidays, Cassie! I love roasting chickpeas. I love making them sweet like yours with lots of brown sugar and cinnamon…all gooey and carameley! L-O-V-E chickpeas. And this? Just stop it. Lord yes. I’m totally making this come January 1st when I need to get on the whole “eating healthy” thing again. They look like an awesome and healthy little snack! I love chickpeas. I’ll bet these are great roasted and spiced! yum yum! these look great! These look like the perfect snack food for New Year’s Eve! I have never tried roasting chickpeas but have always wanted to! This sweet version will be just the recipe to get me to try it! Great idea! What a great snack to put out on New Years. Thanks! These are truly awesome with cajun seasoning, but I’d love to try your Greek seasoning version! Double YUM! I’m a savory girl so the savory side is my favorite!! Great recipe! Have a Merry Christmas!! That is way too cool! 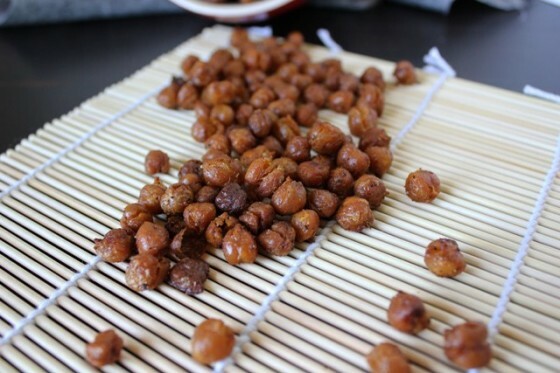 I love chick peas and I bet these are amazing! The idea of crispy chickpeas is too delicious for words! perfect snacks… especially during the day time. I LOVE chickpeas! They are so deliciously addicting. I like that you have two versions here…I just might have to try them both! I love chickpeas and is cooked often at my place. I have never roasted them before, sounds like a great idea for a snack. I love chickpeas. Roasting them makes a great snack! My husband and I cannot be trusted around roasted chickpeas. Its our favorite snack! I love roasted chickpeas every which way. Thanks for the great recipes and Happy Holidays! These look delicious! I’ve never thought of snacking on chickpeas in anything other than hummus form, I’ll have to try the spicy ones. Ooh yum! This would make for a perfect snack! Thanks for sharing C! I’ve seen others loving roasted chickpeas too. I’ll have to give them a try. Wishing you a new year filled with all you favorite things. Yup, this is what I should be eating instead of leftover cookies…great snack! PS: I hit send too soon! And I got your Twitter comment wayyyy late. The joys of a phone without internet 🙂 I am home! Standby was a success! I think rosted chickpeas is a nutritious snack best for me and my kids . Oh, I love love love chickpeas. I’ve been wanting to roast a batch of these bad boys for quite some time but haven’t gotten to it yet. I bet they make for a great snack with awesome flavor. I LOVE chickpeas but I’ve never roasted them before. I think it’s about time I did based on how good yours look! 🙂 Can’t wait to try them out! Spicy or sweet–how do you decide? I can see why you made both! I can’t wait to try these! 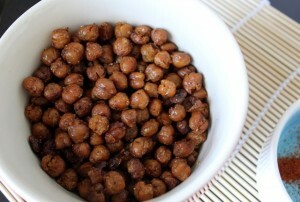 i love sweet roasted chickpeas! i just made them for the first time last weekend. I used Truvia instead of sugar and they were still fantastic! I’ve never tried them spicy.. I might have to try them that way soon!